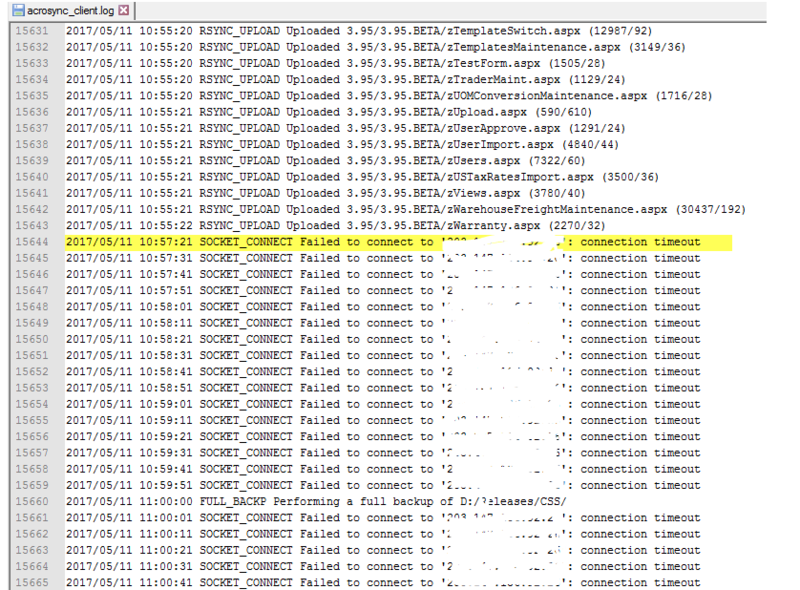 Just letting you know that when Acrosync has a connection error, it will never recover from it. I have to restart kill the program and restart it. Acrosync will retry 3 times on a sync error. I wonder if it is because you have so many profiles that new sync tasks keep coming up while it is busy retrying for existing tasks. I deleted all those profiles and I am running on a single profile now. With Auto-Upload and upload as per schedule. It seems if the internet drops, the auto upload will never recover unless the program is quit from task manager. (Its like it locks up keep on trying). It would be nice that if the auto-upload detects and issue, that it trys the 3 times like you said then wait 60 seconds and try again. Did you have the "Don't stop the profile when a connection error occurs" option enabled? If this option is turned on, it will keep trying to connect when new file changes come in. Not being able to quit cleanly when this happens is a bug and I'll fix it in the next update.